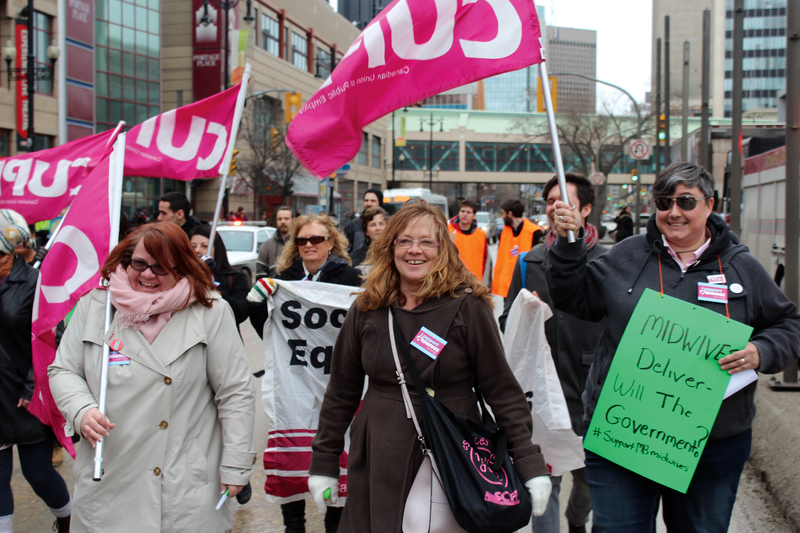 Midwives in Winnipeg, represented by CUPE 2348, scored a major victory for maternal health in Manitoba this past March when they reached an agreement after two years of negotiations. A long and tough round of bargaining eventually paid off thanks to a strong strike mandate, an overwhelming rejection of the employer’s offer, and the use of conciliation services. The midwives received pay increases of up to 18 per cent over four years, improvements to vacation leave, and a retirement allowance. They also reached an agreement with the employer to investigate improvements to service delivery for both clients and midwives. Regulated midwifery was established by the provincial NDP government in June of 2000. The government showed a commitment to growing midwifery care, which included building a world-class birthing centre in Winnipeg. However, issues with midwifery training, recruitment and retention have hindered growth. Over half of requests for midwifery services have to be turned down due to a lack of midwives. Recently, a senior midwife returned to nursing while others were looking to move to Saskatchewan, where a recently concluded agreement would have them earning up to $20,000 more per year than in Winnipeg. Winnipeg midwives feared that a failure to address this issue now could have serious adverse effects on the future of midwifery in Manitoba. The employer’s past promise to take a voluntary look at wage adjustments and pay equity had not resulted in action. That’s why Winnipeg midwives were determined that this round of bargaining was going to address issues of equity and fairness. The community also understood what was at risk, and were a strong ally in negotiations. When CUPE 2348 held information pickets they made sure to invite community supporters - both directly, and indirectly through social media. As a result every action included clients, past clients, and when it wasn’t too cold, children of all ages. Stories in the local papers and TV news programs were filled with images of mothers and babies telling their stories, and showing support for midwives. The community midwifery activists went beyond joining in on union events – they self-organized around the issue. They established a Facebook group that grew to over 1600 members where they shared their stories and made action plans. They encouraged each other to contact Members of the Legislative Assembly, and shared the responses they received. They drafted a petition, collected over 2000 signatures, and delivered it to the Minister of Health. Even after a settlement was reached, the community of supporters remains active. They continue to share stories through social media, and ask politicians to commit to improving midwifery care in Manitoba.